The Dark Side’s secret finally revealed! How can we miss a very large restaurant on a major road, and one which has been there for three years? Very easily it seems, but possibly because the Dark Side residents wanted to keep the secret to themselves. Well, too late – it’s out now. The restaurant reviewed this week is The Courtyard Food & Drink on the road that joins Siam Country Club Road with Soi Nernplabwan. If you are coming from Siam Country Club you pass the driving range on your left and turn right at the major cross-roads intersection with the new 7-Eleven, and head towards the Elephant village. The restaurant is not far and on your right. If coming from Nernplabwan, head down until you reach the T-junction with the temple, turn left and the restaurant is on your left about one km along the road. The restaurant is run by Nongyao (Nute), a vivacious lady who spent many years in Canada teaching Thai cooking, so when she and her husband Geoffrey decided to return to Thailand, it was natural that she should think of running a restaurant, and that thought was finally realized when she took over The Courtyard Food & Drink. When you see the layout of the restaurant, you begin to understand the name. The air-conditioned first section has the street frontage as well as tables and a sit-up bar, but behind that there is a garden courtyard with pergolas, a horseshoe bar, a fountain and some free-standing tables. We decided to dine in the air-con section, but had a glass of house wine each (eminently quaffable, both red and white) while we perused the menu and made our choices. The first impression on looking at the menu was the very reasonable prices, both in food items and drinks. It was obvious this was not a restaurant which would break the bank. It begins with breakfasts, then soups (B. 90-150) then salads (around B. 100) and snacks (B. 60-150) and quick meals (B. 100), then sandwiches and burgers (B. 100-160). Mains cover fish, beef, pork, chicken and NZ lamb (B. 190-390), and pastas and Thai food (around B. 100) and even a page of vegetarian items (B. 100). It is also advisable to look for the blackboard specials, on our night a soup, salad and a roast duck breast for B. 220. Bottled wines (Jacob’s Creek and Hardy’s B. 850) and local beers B. 50-65. I ordered a French onion soup starter (B. 90) which came piping hot with the cheese melted over the bread on the top accompanied by a hot bread roll. A very pleasant dish. Madame had ordered a small salad which she also enjoyed. For mains, I selected the grilled John Dory (B. 250) with mushroom sauce, roast potatoes and vegetables. 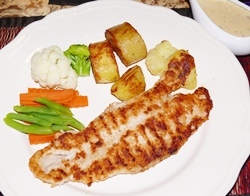 A good sized serving on a pre-warmed plate, the fish had no bones and the thick, creamy mushroom sauce was delicious. Madame had ordered a spicy pla goong, and it was served with true Thai spiciness. Farangs might be better to stick with western choices, but for the seasoned Thai palate, this was a very genuine taste. We had stuck with the house red and house white, with no regrets. However, we had to turn down K. Nute’s offer of an apple crumble dessert, as we were just too satiated, and there was no more room. 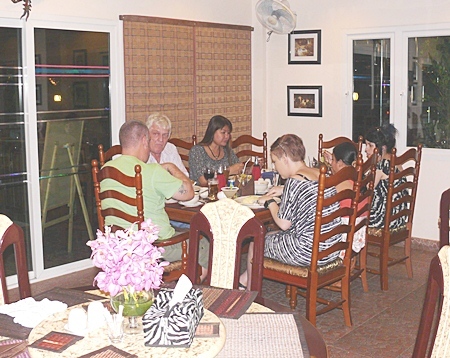 The Courtyard Food & Drink has a very friendly, ‘family’ atmosphere, and combined with good food (western and Thai) and very reasonable prices, we have no doubt that this will become a very well known restaurant for both the Dark Side and the rest of Pattaya. This restaurant comes highly recommended by the Dining Out team. Do try it, you will not be disappointed. By the way, they do a roast on Sundays from noon (B. 220-300 depending upon the size of your appetite) and cater to takeaways. 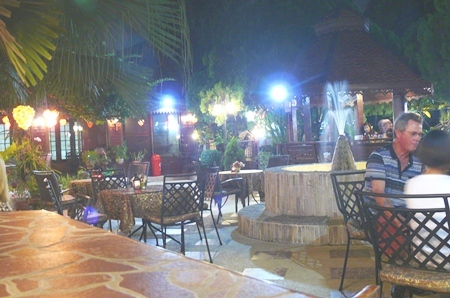 The Courtyard Food & Drink, 1/6 M7, Soi Siam Country Club, telephone 081 250 6400, 038 734 522. Open 11 a.m. until 11 p.m., closed Mondays. Plenty of parking outside and more down the laneway behind the garden courtyard.